Spend a day in the South Texas Family Residential Center (STFRC), and you’ll realize the extent of the criminalization of immigration. Its name may conjure a variety of pleasant images; now reframe them. The facility is surrounded by barbed wire, a high fence, and security cameras. It’s a prison holding women and children asylum seekers, the majority of whom broke no laws, but are detained for weeks on end. While volunteering with the CARA Pro Bono Project at the facility, we witnessed women and children experience re-traumatization, with overworked and underpaid guards yelling at babies and heavily surveilled asylum officers asking women to tell and retell horrific stories of abuse and asking confusing questions like, “Is your child a terrorist?” Family detention centers are uniquely appalling, yet they are only one part of a much broader system of U.S. immigration control, fed by institutional racism and global capitalism. Companies and government bodies benefit from the criminalization of immigrants. Immigrants are often blamed for costing U.S. taxpayers “billions of dollars.” In reality, it’s not the immigrants, but corporate and government responses to immigrants that end up costing so much money. Immigration control and the broader system of mass incarceration, which are often framed as “broken,” actually work really well for key institutions, groups, and individuals.It’s not the immigrants, but corporate and government responses to immigrants that end up costing so much money. Corporations financially benefit from immigration control and have donated millions of dollars to politicians who support the expansion of the criminalization of immigration to increase the number of detainees and the length of time for which they will be held. Immigrants, in effect, have become another supply group in the growing prison industrial complex, funded by taxpayers and financially benefiting global capital. At the STFRC, for example, Immigration and Customs Enforcement (ICE) established a $1 billion four-year contract with the private, for-profit company CivicCore. For-profit companies are reimbursed at an average rate of $119 per detainee per day. For-profit companies house more than 70 percent of all detained immigrants in the U.S., and according to the Trump administration’s budget proposals, both the number of detained immigrants and the proportion detained in privately-managed facilities are bound to increase in the near future. Indeed, the immigration control system is a multibillion-dollar industry in the U.S. During FY 2016, a single deportation conducted by ICE cost taxpayers, on average, $10,845. Mass deportation, a practice Trump supports, would total $114 billion if ICE were to remove an estimated 11.3 million people living in the U.S. without authorized documents. In 2018, $44.1 billion in discretionary funds were allocated to the Department of Homeland Security, with over half directed at immigration control. Compare this to the allocation of $45.7 billion in discretionary funds to cover the annual budget for the entire Department of Education. Just $29 billion funded the Department of Justice and $32.5 billion funded the Department of Energy in the same year’s budget.The immigration control system is a multibillion-dollar industry in the U.S. Global capitalism and institutional racism produce the “facts” that are used to justify immigration control. Corporations, institutions, and individuals regularly criminalize immigrants to justify policies and practices that maintain inequality. Blaming the marginalized for their marginalization through the creation of alternative facts about immigrants follow a common ideological weapon wielded by powerful groups to “clothe the rude facts of expropriation.” Discriminatory practices produce the stories, the stereotypes, and the controlling images used to maintain inequality. Laws and criminality are socially constructed, and the “illegal” or “criminal” label is not applied equally to all lawbreakers. Civilians constantly break civil and criminal laws (e.g., jaywalking, underage drinking, illegally downloading music, and speeding), but for the most part, we don’t call them criminals for these offenses. In contrast, undocumented immigrants are labeled “illegal” and “criminal” simply for existing within a country’s borders. Often, they are disproportionately punished (sometimes deported) for minor civil violations. That is, undocumented immigrants, already labeled “illegal,” can subsequently become criminals through ICE raids and routine traffic stops. Most states no longer accept passports, consular identification cards, or international IDs from state residents, and refuse to grant state driver’s licenses to residents who are undocumented. A minor traffic violation by an undocumented immigrant can, thus, result in large fines and a criminal record, potentially leading to imprisonment and eventual removal proceedings. Because law enforcement targets immigrant communities and Black and Brown drivers, and because Latinx immigrants comprise more than half of the undocumented population in the U.S., Latinx immigrants are disproportionately criminalized. It becomes a circular argument—the fact that the Latinx community is overrepresented in jails and prisons and more likely to have criminal records is used as a rationalization for increased border control and interior immigration enforcement. Their illegality and criminality have also been used to feed the illogical and invalid argument that “illegal aliens should not be legalized because they are illegal.” But they are “illegal” and excessively criminalized because of institutional discrimination. Discriminatory practices produce the stories, the stereotypes, and the controlling images used to maintain inequality. We see similar processes occurring in the Black community in the United States. In reality, immigrants and their communities face extreme threats. Controlling images of threatening immigrants, such as dangerous criminals, bad hombres, gang-bangers, and rapists, do not affect all immigrants equally. They predominantly target Latinx and darker-skinned immigrants. But nearly all immigrants, their families, their communities experience extreme threats stemming from exclusionary policies, practices, and narratives.The criminalization of immigration has decreased public safety. The criminalization of immigration has decreased public safety. Fear of apprehension, arrest, and deportation prevent immigrants from interacting with law enforcement officers, public servants, and government workers, which can result in community disengagement, apathy, and under-reporting of crimes. Immigrants do not trust and instead fear law enforcement, which has the power to begin deportation proceedings against them, as well as their relatives and friends. Recent media footage demonstrates this visceral fear—immigrants who have called the police to report a missing child, domestic abuse, or violent altercations have instead found themselves arrested. As a result of the intensification of immigration control, sanctuary cities in which local law enforcement decline to cooperate with immigration officials so as to rebuild community trust have become more prevalent, and the federal government has responded with threats to withhold funding from such governments. All this undermines public trust toward government at the local and federal levels. ICE raids or the threat of ICE raids in schools, the workplace, and communities have resulted in heightened anxiety among the immigrant community. Recently, ICE arrested 100 undocumented employees at a meatpacking plant and approximately 500 students were missing from school the next day. Children are afraid to attend school and interact with teachers, worried that their parents and other relatives will be harassed or deported, resulting in disengaged students who can’t focus on their schoolwork. And, once again, corporations indirectly benefit: immigrants who constantly fear the threat of deportation constitute a vulnerable workforce ripe for employer exploitation. 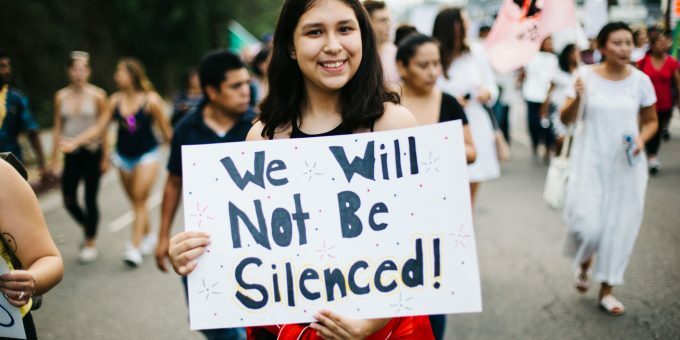 Genesis Torres is an undergraduate student at North Carolina State University, where she serves as the President of Students for Immigrant Rights. This past spring, Torres organized a service trip to the South Texas Family Detention Center. Kim Ebert is in the sociology department at North Carolina State University. She studies the causes and consequences of collective action, the politics of immigrant adaptation, and the maintenance of racial inequality.